Operational amplifier circuitry generates the crossovers between tweeter and midrange, midrange and woofer, and equalization for the 3-way, open-baffle loudspeaker. Crossover frequencies are set to 100 Hz (12 dB/oct L-R) and 1400 Hz (24 dB/oct L-R). The 6 dB/oct open-baffle diffraction slopes of woofer and midrange are equalized and also the half-space to full-space transition between floor mounted woofer and free standing midrange. 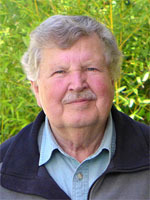 Psycho-acoustic equalization is provided for the 3 kHz region. Circuit behavior is described by the following functional block diagram. The electronic circuit diagram for implementing the above functionality is shown below. Download the 38xo_eq1.gif file to resize the circuit schematic on your computer for printout. 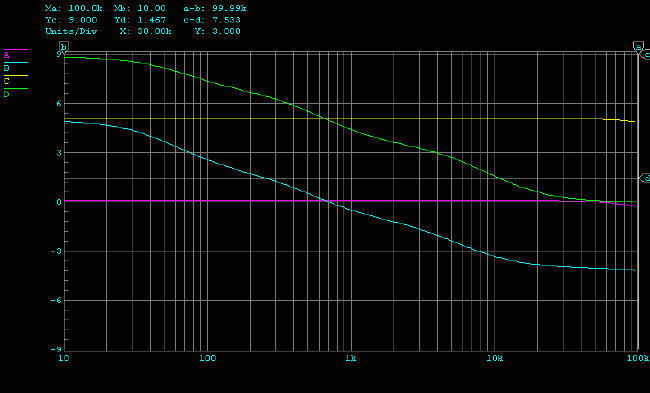 Calculated frequency response curves for buffer, tweeter, midrange and woofer outputs can be seen in xo_eq2.jpg. Subtract a 20 dB graph offset from the vertical scale to obtain the true gain values. You will find measured frequency response data on the | Test | page. The circuit description follows the signal path from input to the three outputs. 140kLP -6dB - Low-pass filter to block radio frequency interference. 6dB attenuation to compensate for the following 6 dB gain stage. Buffer - Low impedance drive source for the following three channels. 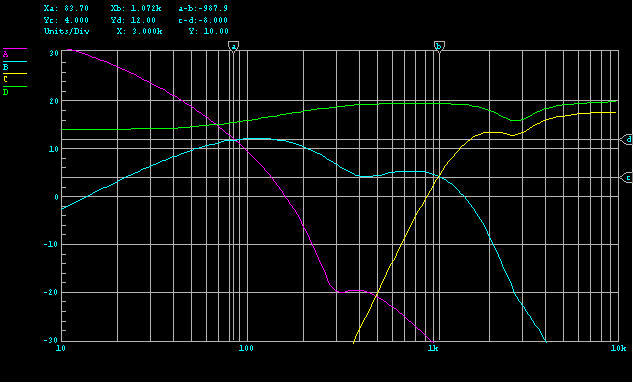 90HP - First high-pass filter section of 12 dB/oct, 100 Hz L-R acoustic crossover to woofer. 2HP - High-pass filter to block any dc offset voltage from reaching the power amplifier for the woofer. The low cut-off frequency of the high-pass filter reduces low frequency phase distortion for improved realism of bass reproduction. All operational amplifiers are Burr-Brown OPA2134. Circuit components may be purchased from suppliers such as Digi-Key and Mouser . A blank printed circuit board, material list, and loading chart to simplify construction of the PHOENIX crossover/eq electronics is available. General topology printed circuit boards WM1 and MT1 can be used to build selected sections of the circuit. As I mentioned in the "PS" to Sound Reproduction it is very important to have playback volume control at the listening place. Ideally, the control has digital readout so that one can directly return to the preferred setting once it has been found for a particular CD or LP. To correct for occasional channel imbalances at the listening position, it is nice to have a balance control handy. Channel polarity switches are sometimes desirable. Recording techniques can be investigated by reversing the polarity of one channel. The audibility of absolute polarity is tested by reversing both channels. Finally, for a speaker like the PHOENIX that is flat on-axis and similar in its power response, some recordings may sound bright because the microphone pickup was too close to the instruments. To correct for those situations I have found a frequency response downward tilt of 3 dB/decade to be a subtle, yet effective remedy. The tilt is also beneficial when listening very close to the speaker in a small space, or when listening at lower volume levels. A tilt control can be added to the crossover/eq by adding circuitry to the buffer stage that drives the three filter channels ( 3db_buff.gif ). The response of the tilt circuit is given by the top two curves of the 3db_oct1.jpg graph with the toggle switch set to on and off. One way to obtain remote volume control is to build a separately housed preamplifier which is connected via cable to the crossover/eq. All the desired control functions can be assembled into a small package for convenient adjustment from the listening place. A circuit for this is shown in preamp1.gif, gain-adj.gif. It combines volume, balance, mono-stereo switching, polarity and tilt control functions. The frequency response of the tilt control is given by the lower two curves of 3db_oct1.jpg . The umbilical cord between preamplifier and crossover/eq consists of four coaxial cables for left and right channel inputs and outputs, and two wires with shield for the +/-15 V supply and ground. For many years I have used my own 8-channel power amplifier, which was designed around single National Semiconductor LM12 power opamps of 40 W per channel, for a system similar to the PHOENIX. Today one might select the LM3886 , selling for $9 each. A printed circuit board is not needed for the heat sink mounted power opamps, because the few additional components can be wired point to point using terminal strips and a copper plane for signal ground ( 3886amp.gif ). The voice coil presents a very easy load to the amplifier and there is no risk of high frequency oscillation due to capacitive loading. Use one opamp per driver. I have not found it necessary to provide speaker protection and drive even the tweeter from a full bandwidth power amplifier. If you want greater voltage or current capability, then use opamps in bridged or paralleled configuration. Bridging two devices doubles the voltage swing, but does not increase the maximum output current capability. It is useful for higher impedance loads. Paralleling two devices doubles the maximum output current, but keeps the same voltage swing. It is useful for driving low impedance loads. Several opamps can be paralleled to increase current capability n-times. A 200 W amplifier can be built with two paralleled LM3886 in each leg of a bridge configuration. Check out the new LM4780 dual power amplifier. It has two 60 W amplifiers in one package which gives close thermal tracking, important when bridging or paralleling amplifiers. Alternatively, you might consider a battery supply, where the batteries are trickle charged. The power supply constitutes the major cost for this type of DIY amplifier solution. Jeff Rowland Design Group (models MC-6, Concentra, Monoblock 6). In all cases, most important are low output impedance (<0.4 ohm) and low distortion (<0.1%) of the amplifier over a 5 Hz to 50 kHz frequency range.